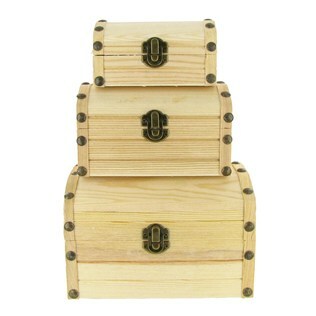 Medium: 6" x 4 3/8" x 3 1/2"
Another note about the boxes on the Hobby Lobby website - they state they cannot break the boxes up. This might be an online only issue, because they did not have the boxes in sets at the store, you could only buy them individually. 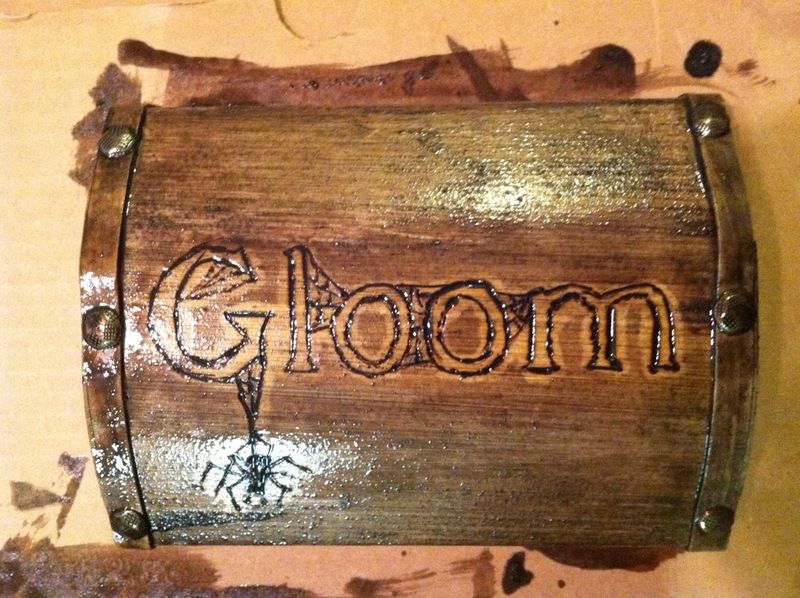 So the first step I took was to make a template of the Gloom logo. If you are not familiar with the game, I will provide a review in the upcoming week or so. The game is published by Atlas Games and has had 2 incarnations - regular Gloom with 3 expansions and Cthulhu Gloom with 1 expansion. 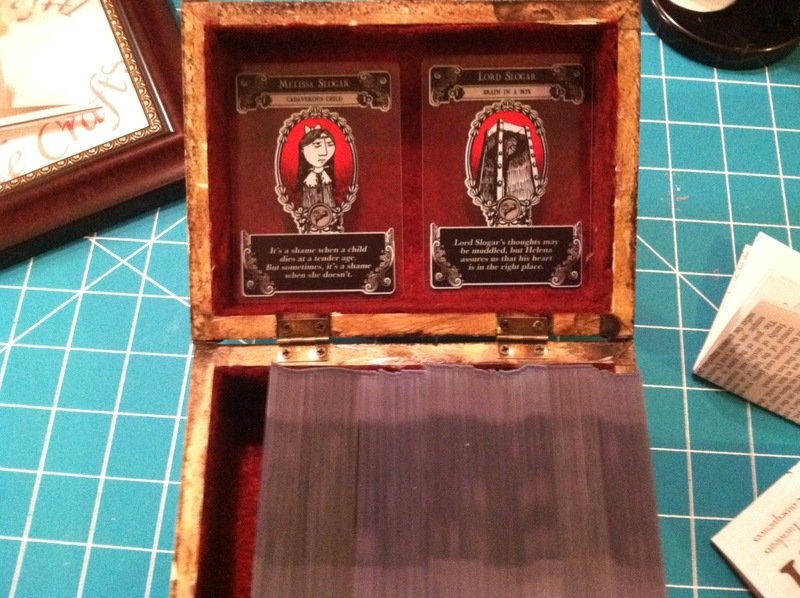 All of the card sets are compatible with each other, you just need to have one of the core boxes. I printed this image out on card stock, then used a swivel pen knife to cut out the letters. My template wasn't perfect, but this wasn't going for perfection. I wanted the unique antique sort of look - something you might find in the attic. 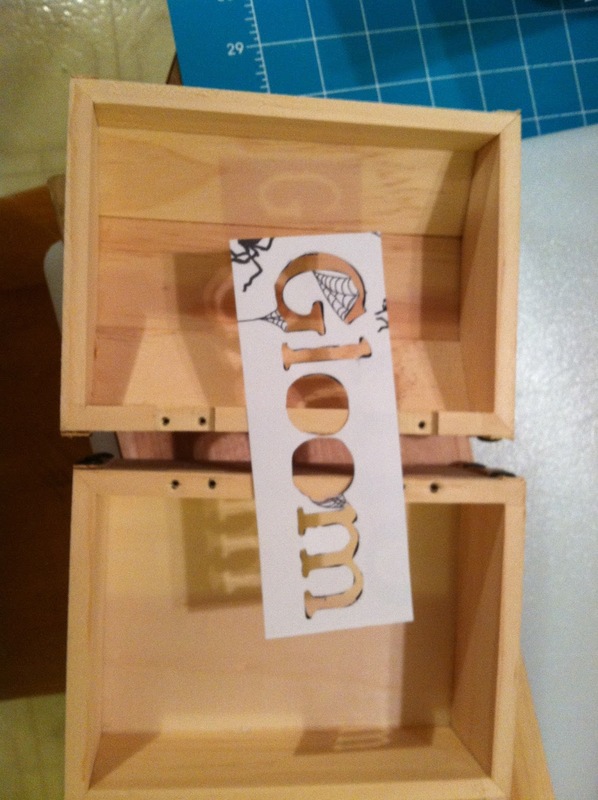 After I cut out the letters, I set the template to the side and took the hardware off the box. 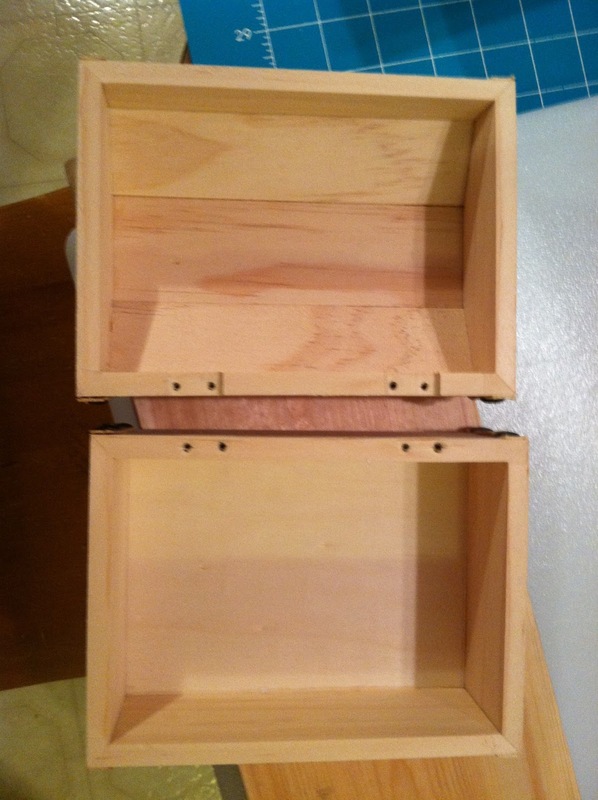 The box without hardware and with the template resting on top. 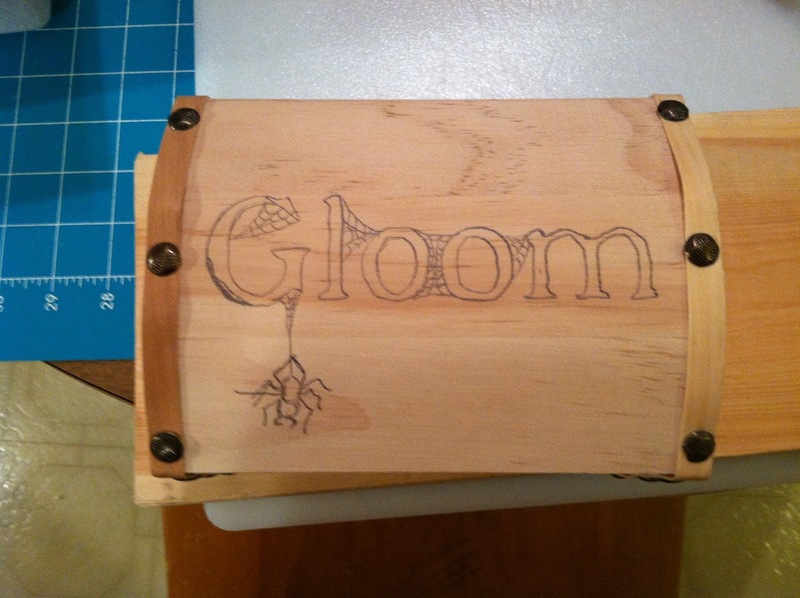 With the box disassembled, I used a template to sketch the Gloom logo on the box top. Next it was time to break out the wood burner. I considered just painting the logo, but that didn't feel right. 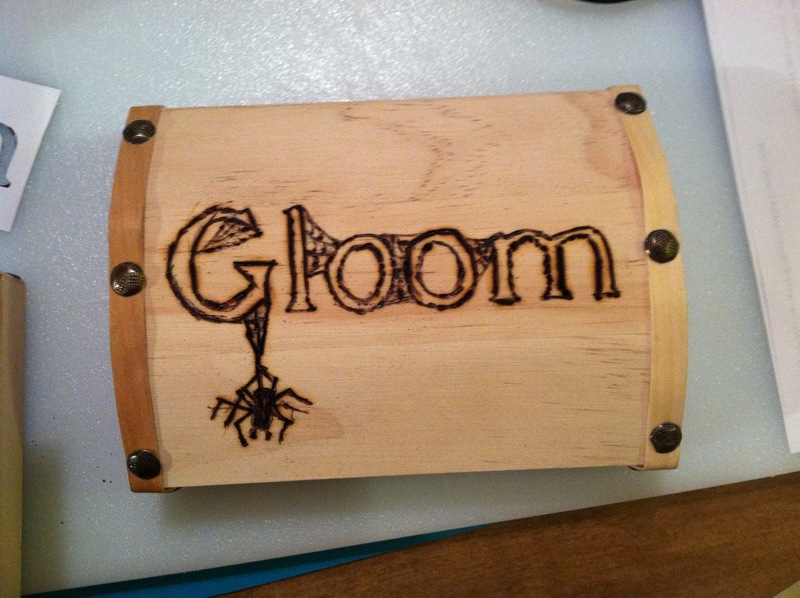 Burning, yes, burning the box felt right for Gloom. Wood burner gets HOT! While the wood burner was warming up, I took measurements of the interior of the box and made a pattern to cut out my felt sections (2 sections, 1 for top, 1 for bottom, but used the same template for both). 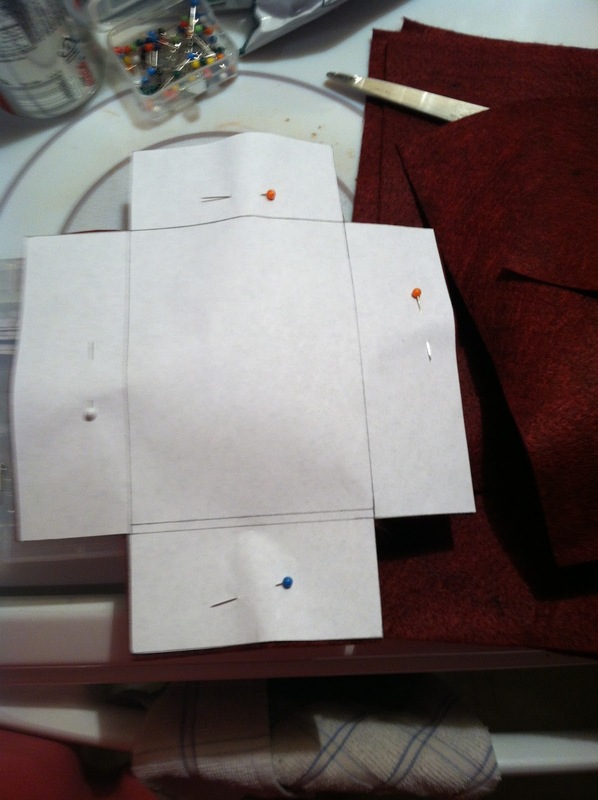 I prefit the felt after I cut it out. There was a little lip at the top that I knew I would have to trim, so the first shot with the pattern worked as planned. Just a note here, if I were going to make another one of these, I would try cutting these out in sections. 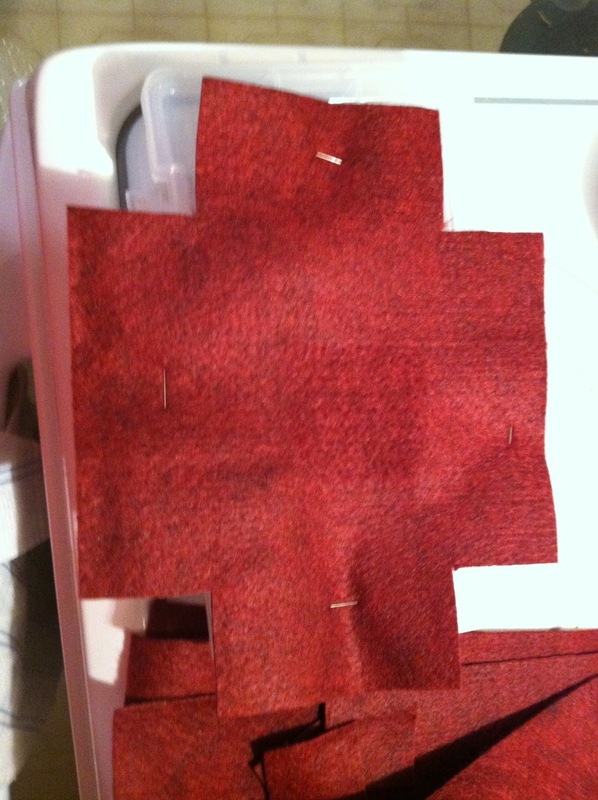 The single felt piece looks good, but there were some issues when laying it in with the glue. 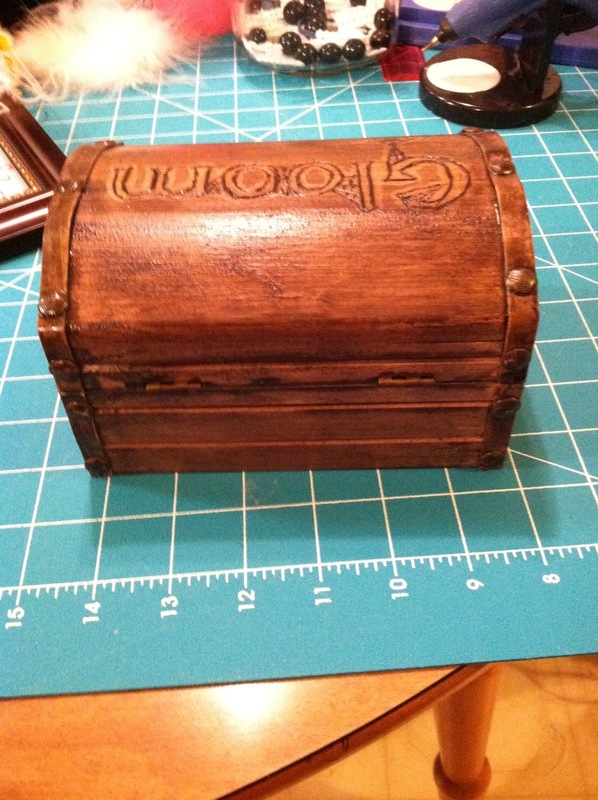 Speaking of which, I used the Elmer's Spray Adhesive, and I do not plan to use it for anything like this again. The can puts out a LOT of spray, kicking a lot of adhesive in the air. 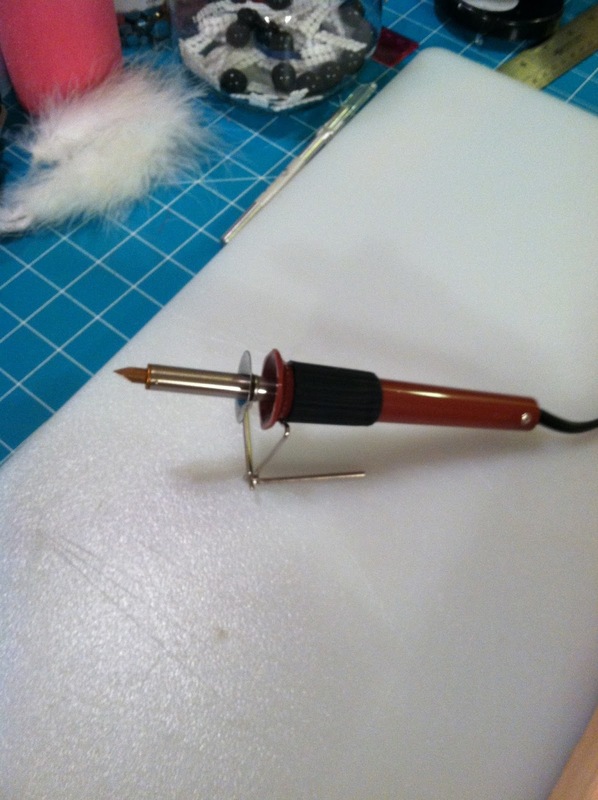 Also, I think brushing the adhesive on would be better if I made another. Now that is jumping ahead a bit, so back to where we are. The wood burner got to the right temperature (we have a multi temp wood burner) and I took my first foray into using a wood burner. I used a practice piece of wood first, just to see how it worked. 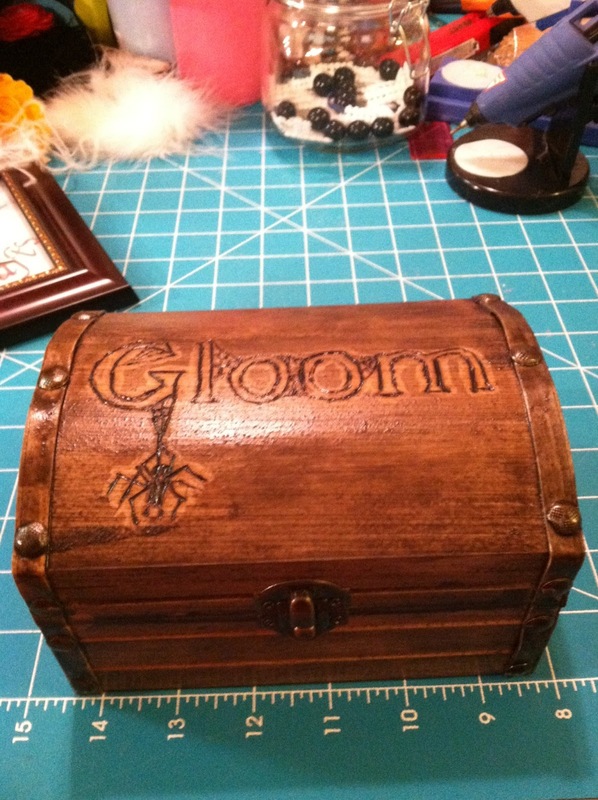 I proceeded to burn the Gloom logo into the box lid. I was pretty happy with how this turned out. 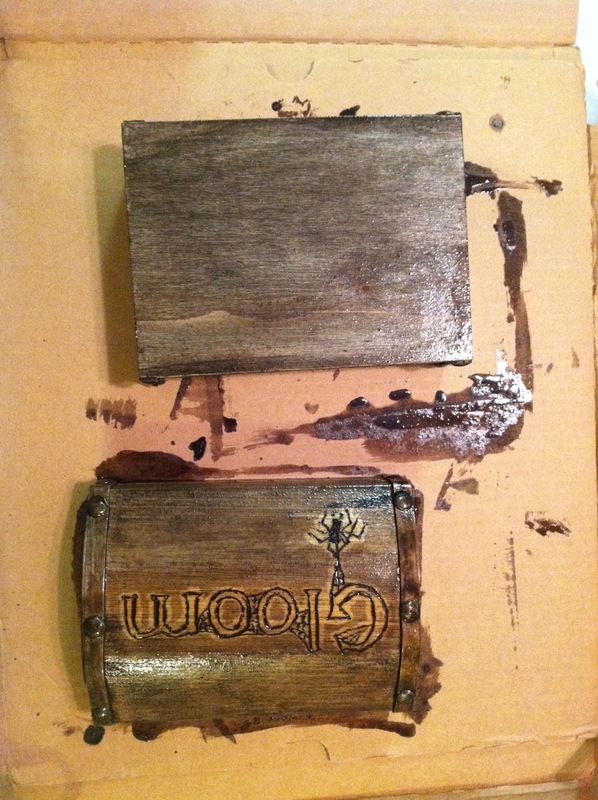 And with the logo burned in, it was time to start the staining process. I went with 2 coats for the exterior and 1 coat for the interior using Minwax Tudor Satin polyshade. 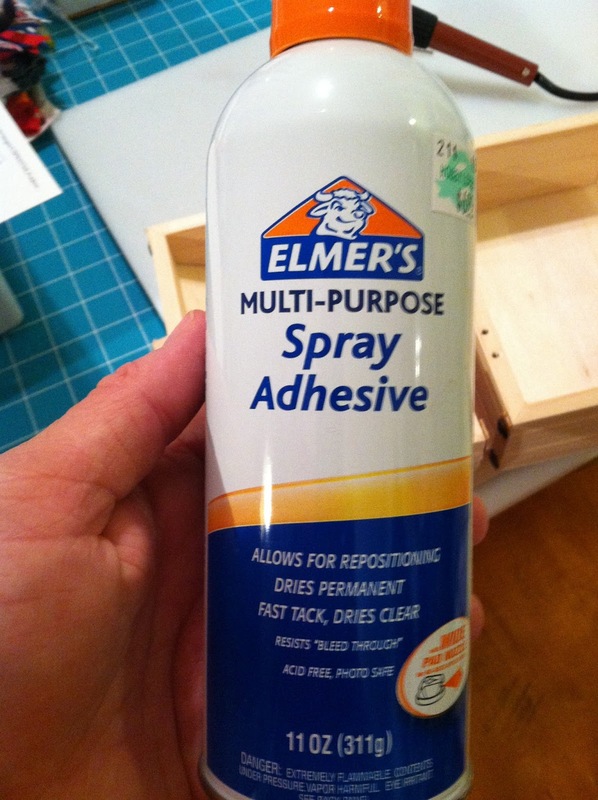 This is the same stuff some people use for sealing and shading miniatures (also the same reason I have it). 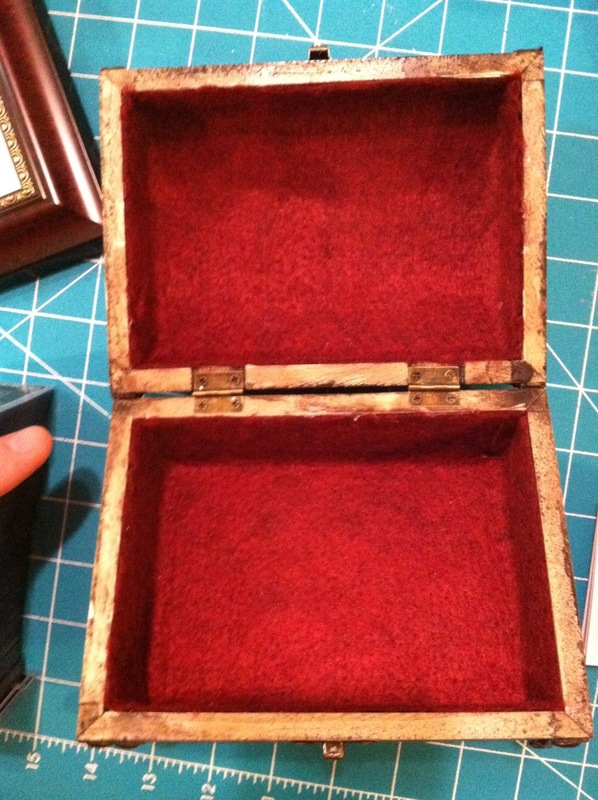 After the stain had dried for a bit over 24 hours, I took a very fine sandpaper and went over the exterior of the box. If you feel the stain when it dries, you get little bumps and rough places. 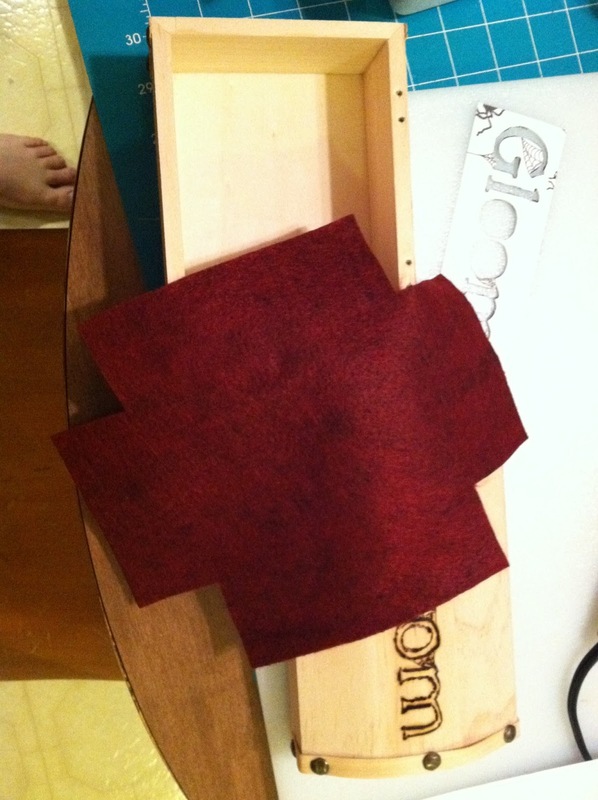 Going over lightly with very fine sandpaper gets rid of these and gives the box a smooth finish. 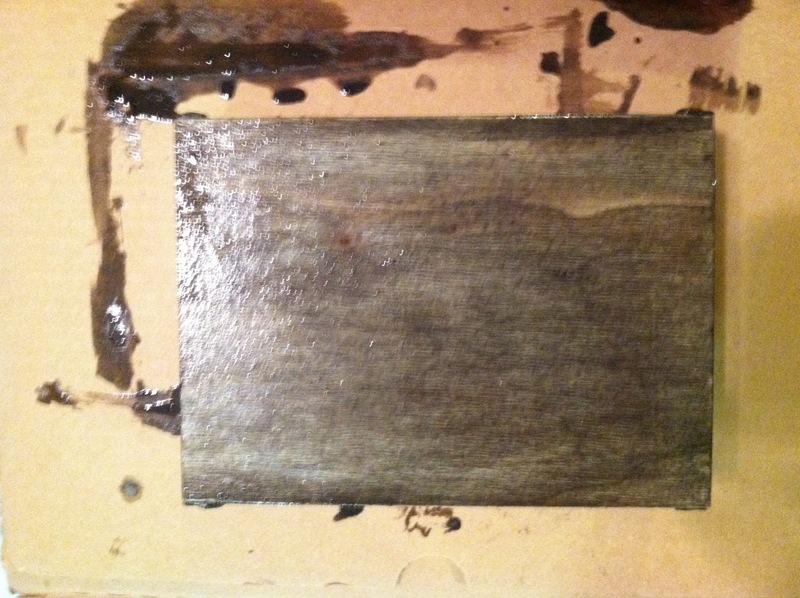 Then a damp paper towel to get any of the sanded stain cleaned up. 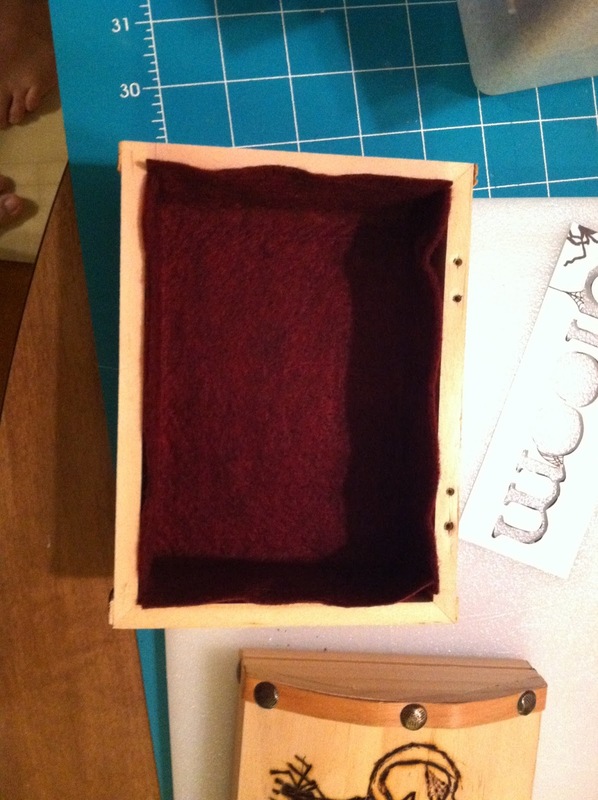 Next up was lining the interior with felt. Yeah, back to that spray adhesive. Never again for something like this. I could see some use if I were interested in trapping flies or spiders, but hobby projects? No thank you. So the first step is to tape off the box. 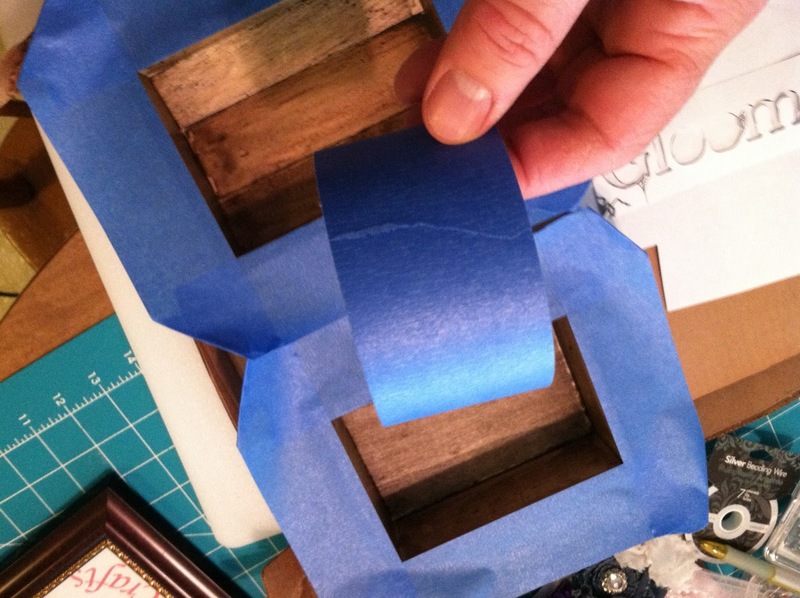 I used a wide 2-3" painter's tape and taped off both top and bottom at the same time. This worked well as it provided a good lip for using spray adhesive. I didn't take photos of the steps where I applied the felt due to the whole adhesive thing. 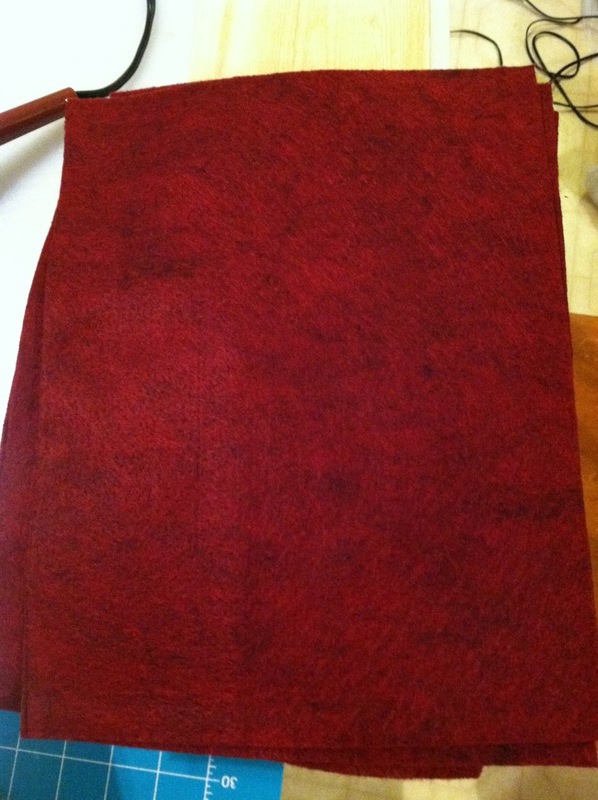 I applied the adhesive, let it dry for 24 hours, then trimmed the felt. The last step was putting the hardware back on, which took all of 5 minutes. Here is how everything turned out. I've got room for maybe 1 more expansion if they release it. I would have liked to have a larger box, but this was the largest they had in stock at Hobby Lobby. But the lessons I've learned through this project will help me out if I need to expand it. 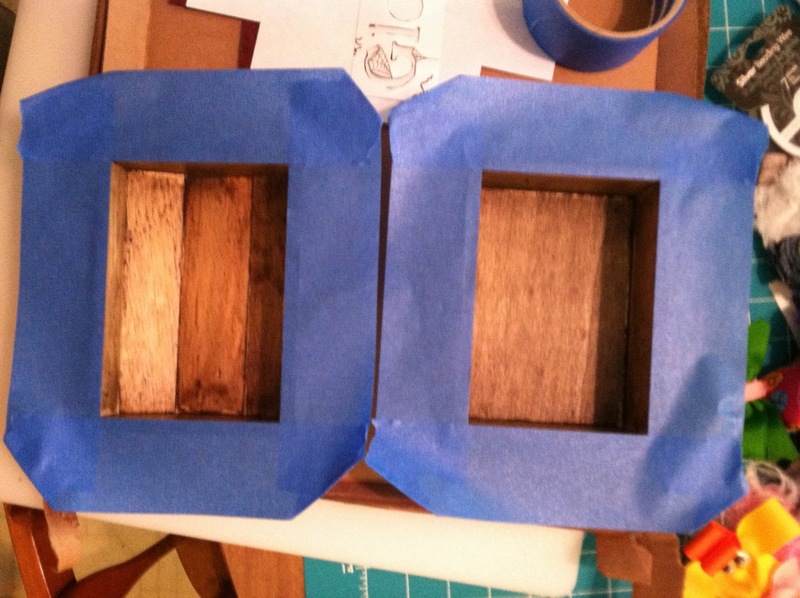 I think my next project of this nature might be etching an acrylic box for my Netrunner cards. But I'll have to do some thinking on that first. Also, thanks to my wonderful wife for her assistance during portions of this project. She was an invaluable help! This tutorial and box is amazing I'm planning on making something like this if not emulating it completely :) however I have Unfortunate expeditions, unquied dead, unhappy homes, and unwelcome guests as well as the base set would these all fit in the box? 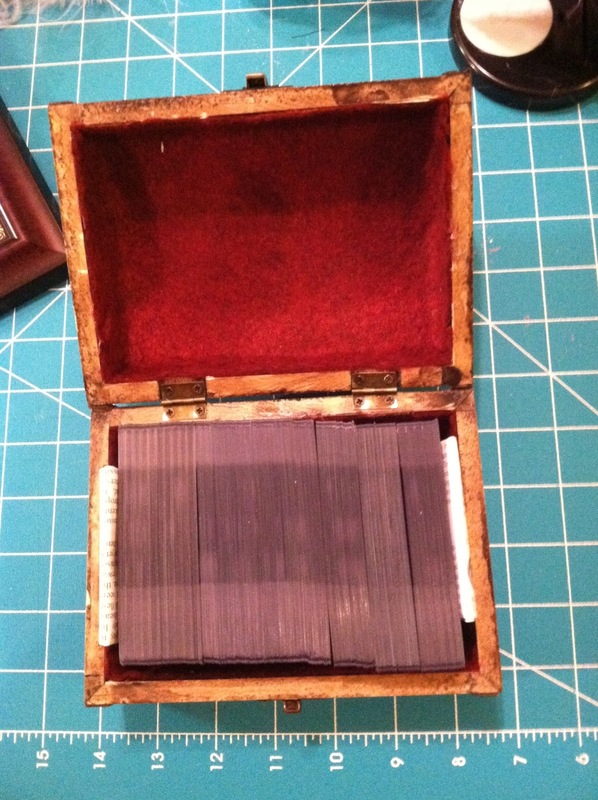 I don't know if in your box it has all of those sets or if it's everything until unquiet dead. Either way thanks for sharing such an awesome project. Thanks for the comments. I feel it works very well for the Gloom feeling. I think you will be fine with the sets you have. I actualle have the following in mine and it fits pretty spot on. Awesome! Thanks for the response and again thank you for the tutorial! Keep up the awesome work on your blog!